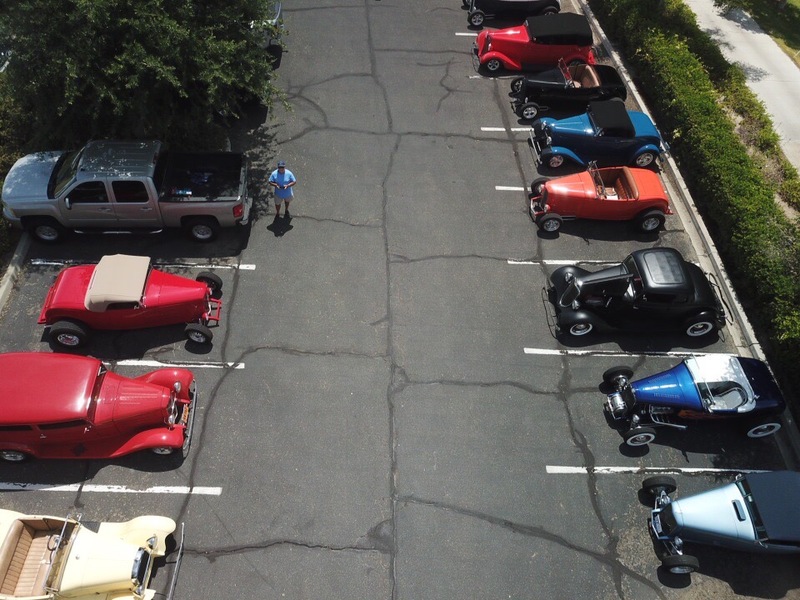 Our 4th annual meeting with the CCR and others was a huge success with 45 cars and 63 people attending the luncheon. The weather was on the hot side but bearable. 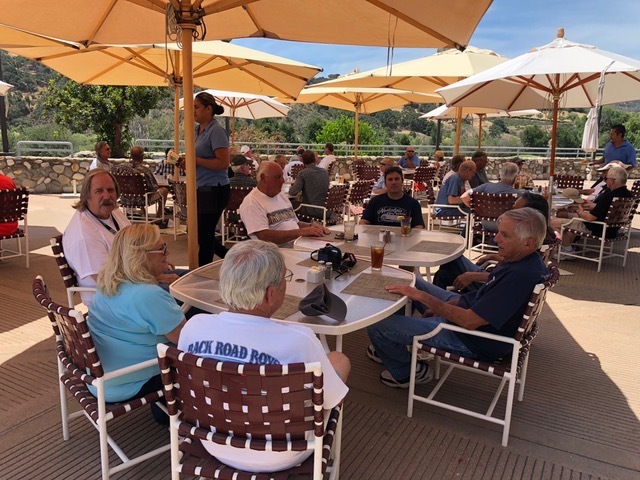 The River Grill at Alisal was the meeting place with a garage tour at Steve’s Hot Rod Garage after lunch. Steve also served Root Beer Floats for all of us to enjoy. Thanks Steve for the ice cream and tour of you garage. Steve had his new Hercules Woodie on display and his RPU, which was an AMBR contender. 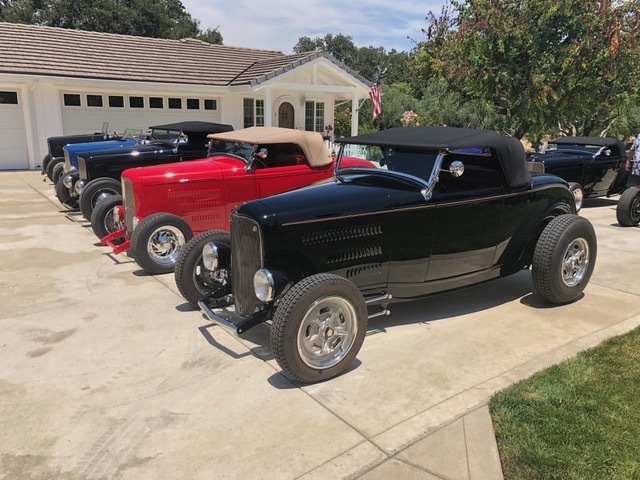 Steve lined his long driveway with 32 roadsters about 30 in total. 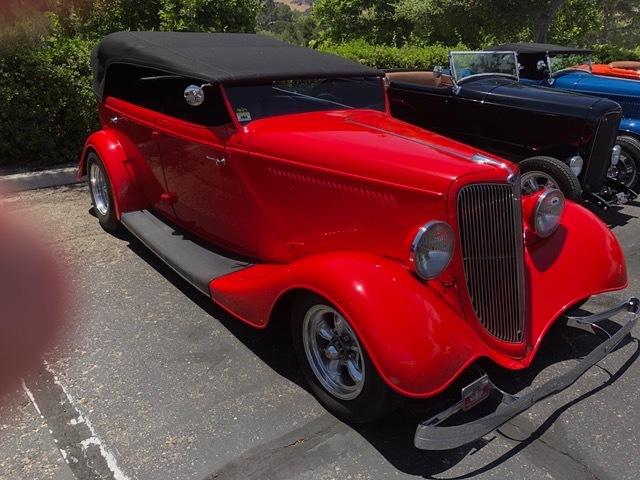 The Deuce roadster is still the King of roadsters for us older folks. Jane and I drove Poppy for the first time after some major fixes were completed over the last couple of months. She ran just fine along the coast and got a little hot inland with the heat nearing 100 degrees. Gordon came to the rescue with two gallons of coolant on hand. 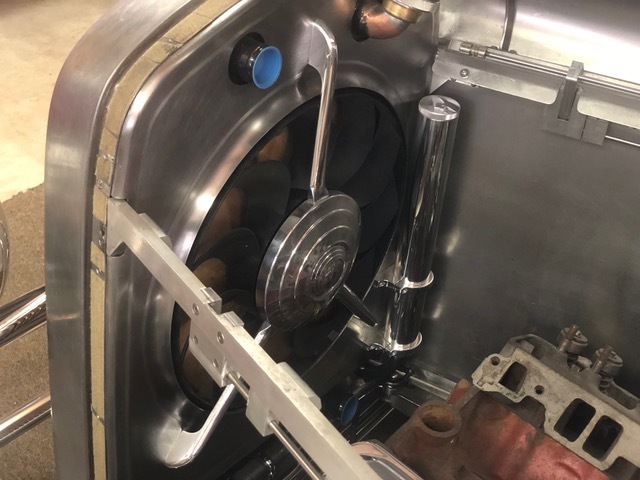 The car has never run hot in the past but it has not been that hot when driven. The car cooled right down to 180 for the rest of the trip as we left the mountains. I need to flush the radiator as the cap indicating some rusty looking slush. I will do that tomorrow. 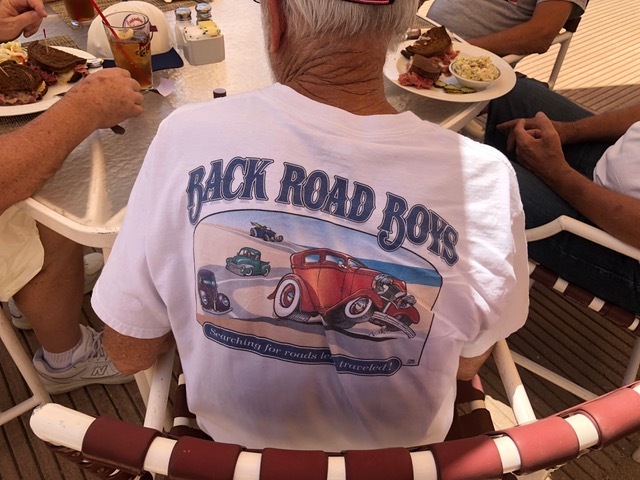 I guess the only sure cure is to install an electric fan for those hot spots we encounter on our trips with the Back Road Boys. 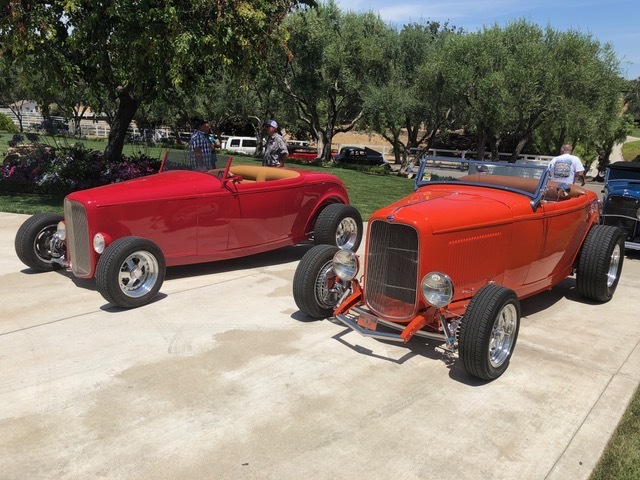 Once again Jane and I love driving the Boyd roadster and really enjoy the smooth ride the chassis provides. I know they are no longer in style but for us they are just fine and we return home with our bodies not beat up from our rough roads. 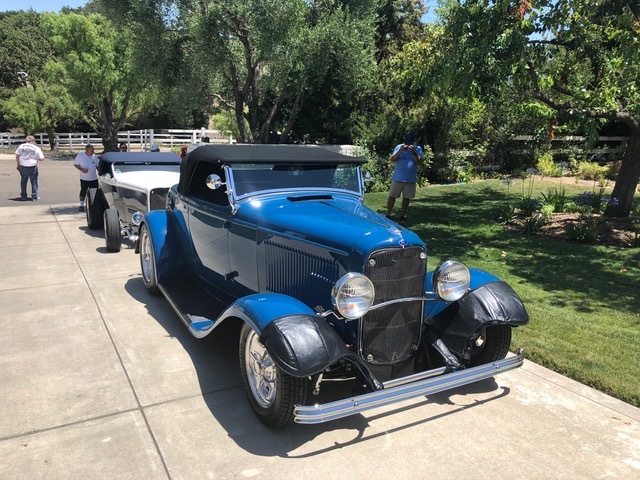 Thanks Walt for letting us be the caretaker of this beautiful roadster. 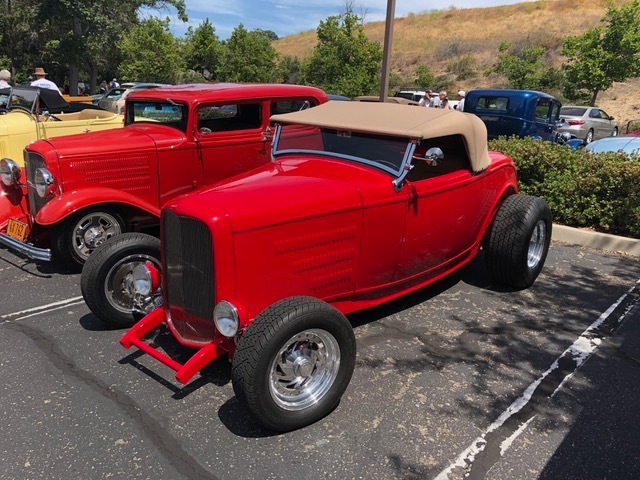 The love of roadsters continues with many of us and while common place in the past, they are becoming scarce at shows today. 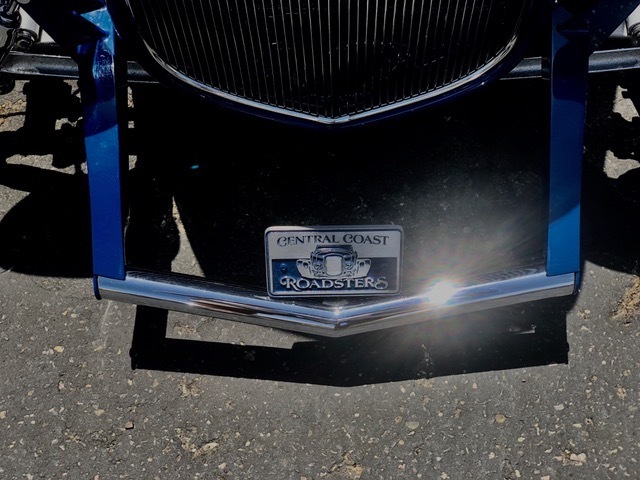 We hope to keep our Fire Burning for the roadster for many years to come and look forward to next years meeting with the Central Coast Roadsters and others from the coast area. Jane and I would like to thank all of you who attended and hope you will join us again next time. A special thanks to Steve and Bobbi at Alisa River Grill. Early arrivals at the River Grill. 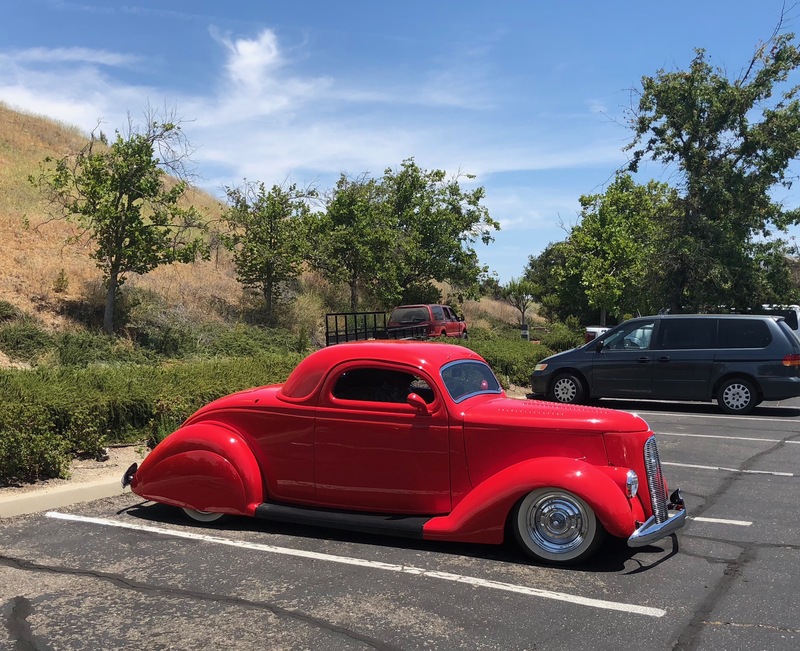 Some coupe shared the parking area. Mike had his really nice tub at the luncheon. A great looking Phaeton! We had 53 for lunch and enjoyed the camaraderie of the group. 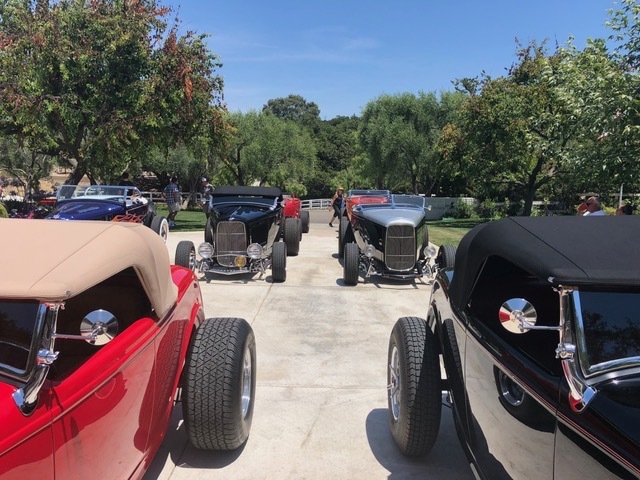 After lunch we headed to Steve’s Hot Rod Garage. 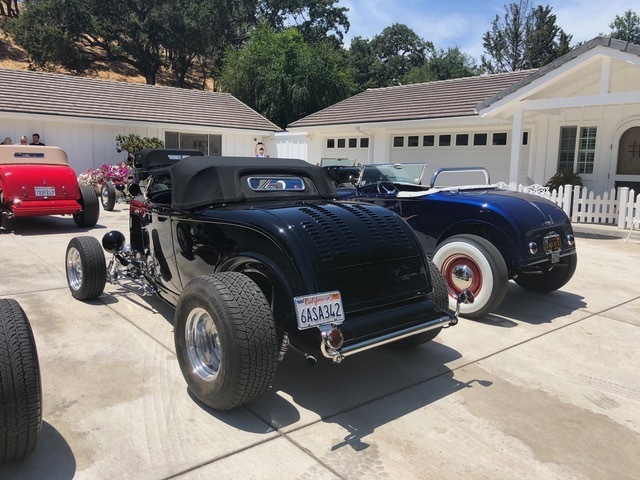 He lined up his long driveway with Deuce roadsters. 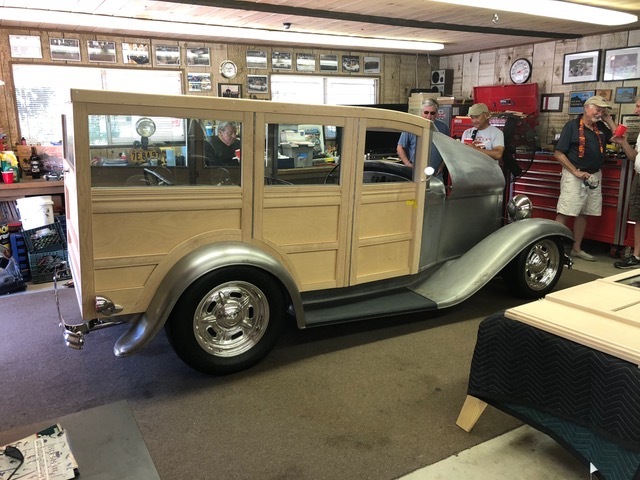 Steve has his Deuce Woodie looking fantastic. Details, Details are everywhere. 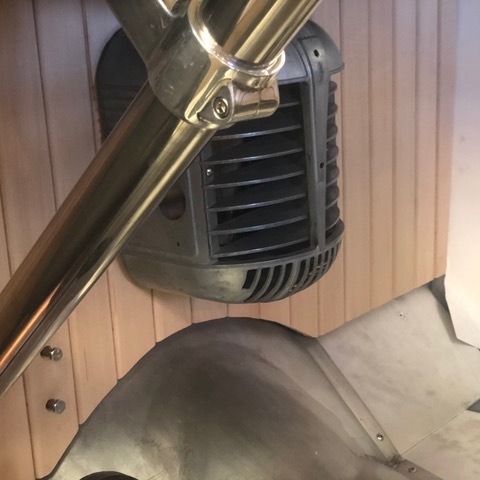 Electric fan shroud with Deuce hubcap for the center. Wood paneled firewall for affect and insulation. Rich had his drone working and captured some aerial shots for Pewsplace. 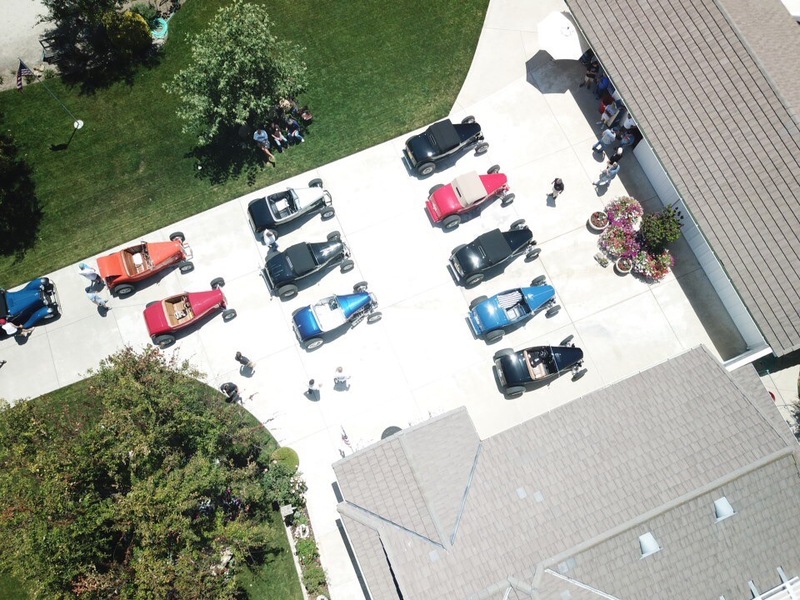 The roadsters from the Drone. Steve’s house is a beautiful place with luscious grass and landscaping. 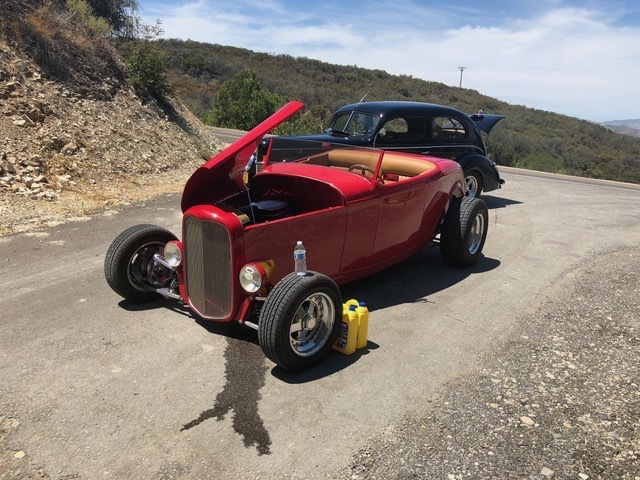 Steve also has a new roadster with a Boyd chassis that is flawless. All the roadsters were lined up in rows. All in various colors and styles. 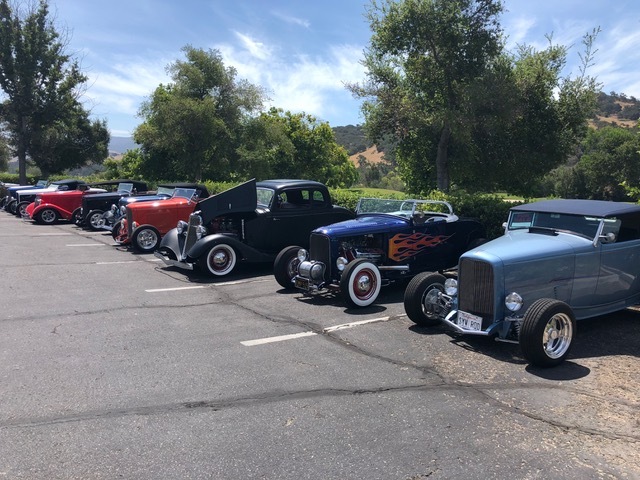 More Deuce roadsters than you can count. A newly built beauty was just purchased and Jane fell in love with this on. Poppy and John had the love affair parking spots. Smooth and Traditional looked good together. Some customs showed up for the luncheon also. This 36 was right out of the 40’s. “What could possibly go wrong!” Thanks Gordon in the 40. 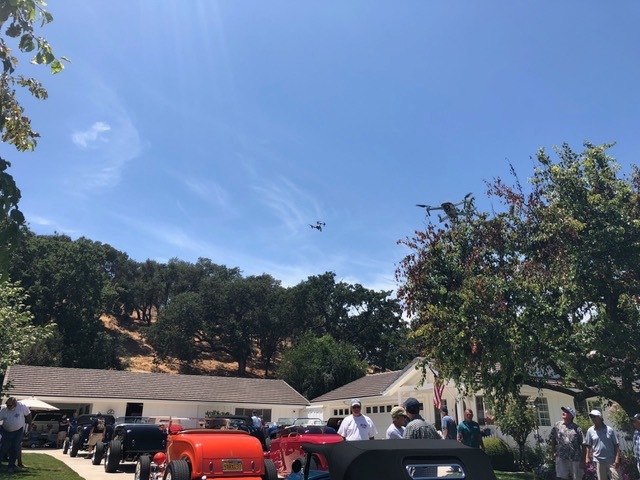 Drones were capturing the roadsters at Steve’s Garage.